Area: A type of chart which presents how related data attributes changed over time, showing the overall trend of their total value. 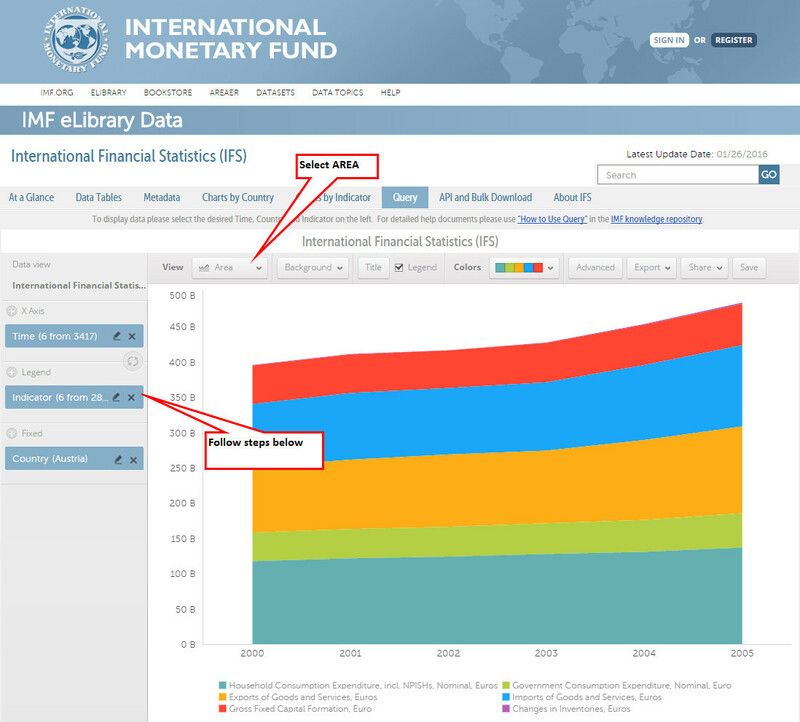 Area chart Instructions - The sample chart uses the International Financial Statistics (IFS) dataset and displays GDP data components from 2000 through 2005. Users may follow the steps below to replicate the below chart. From the pop up dialogue box select 2000 to 2005. Click Apply and OK.
For detailed instructions: Query: How to select time and frequencies for which I want data? Select the following indicators: "Household Consumption Expenditure, incl. NPISHs, Nominal, Euros" and "Government Consumption Expenditure, Nominal, Euros". Click Apply and OK. Select the following indicator: "Gross Fixed Capital Formation, Euro". Click Apply and OK. Select the following indicator: "Changes in Inventories, Euro". Click Apply and OK. Select the following indicators: "Exports of Goods and Services, Euros" and "Imports of Goods and Services, Euros". Click Apply and OK.
For detailed instructions: Query: How to find the indicator for which I want data? From the pop up dialogue box select Austria. Click Apply and OK.
For detailed instructions: Query: How to select the countries for which I want data? To quickly find an indicator, country or time period, use the provided search box. Place cursor over the 'play' icon to see the graph change over time or select each year separately to view it. The system allows dragging and dropping variables between attributes (or by clicking on the wheel icon ) in the Data View pane for different results.